Although it has changed considerably over the years the shirt is the oldest and most basic garment in a man’s wardrobe. It was fashionable during the 19th century for collars and cuffs to be highly starched and to be attached to the more flowing and softer body of the shirt. Working men tended to wear collar less shirts and only to attach collars for special occasions, so the starched collar came to be a mark of distinction worn by the upper and middle classes. 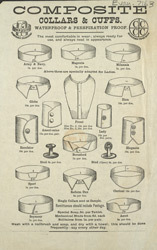 There was even choice in the type of collar that could be worn as can be seen from the illustrations on this leaflet.